All children must be on their sites with a parent during quiet hours. Quiet hours will be strictly enforced. Vehicles: All vehicles must have campground ID visible at all times. Only one camping vehicle and one car per site. Visitors: Daily visitors must register in office upon arrival and leave at quiet hours unless they have registered to stay overnight. Visitors must park in the visitor parking area. An adult member of the campers family must be on the site at all times when the site is in use. Pets: Pets should be leashed at all times. Chains /ropes for pets should not allow the pet to extend off the site in any direction. Pets should never be left unattended. All pet droppings shall be the responsibility of the pet owner. All pets should have proper papers for vaccinations, to be presented to the campground owner upon request. If any pet is creating a disturbance or being a nuisance, the pet shall immediately be removed per the request of the manager. No pets allowed in bathrooms, rec hall, or pool areas. Campfires: Fires may be burned only in fire rings and within the campsite. Do not move fire rings. Please do not burn bottles, cans, trash in the fire rings. Fires are to be kept safe and at a reasonable size (no higher than two feet or knee high). Fires should never be left unattended. All fires must be out prior to retiring for the night or when you are not at the campsite. Trash: Please bring your trash (household waste only) to the dumpsters located near the campground entrance. All other trash must be removed from the premise by the camper. Do not leave food or trash out in the open. This will attract bears. Telephone Calls: A public telephone located behind the campground store is provided for your convenience. Firearms: Firearms of any kind, including, but not limited to, air guns, B.B. guns and slingshots, are absolutely not allowed in the campground. Speed Limit is 5 MPH Day and Night: No skateboards, go-carts, ATVs, 4 wheelers, mini bikes (gas or electric) or trail bikes are allowed in the campground. Golf carts are permitted for seasonal campers only. Bicycles: Please ride with caution. No speeding or riding after dark. Bikes parked are left at the owners risk. Only one person on a bike at a time. Bikes must stay outside and are not permitted in campground buildings. Campground Property Damage: You will be asked to leave if you or your children or guests hack, cut or drive nails or screws into trees, buildings or picnic tables or write on walls of our buildings. Children are not allowed to use knives or hatchets unless supervised by an adult. Standing Trees: Please respect our trees. Do not cut or break any standing tree, dead or alive. Pool: No Lifeguard is in attendance at the pool. Children under 14 years of age must be accompanied by an adult at all times. Glass containers are not permitted. This is for your safety and comfort. Your safety and enjoyment during your stay are important to us. Please note that we do not permit the following at the campground: Fireworks, beer or wine kegs, laser beams (red dot), skateboards or scooters, loud bug zappers. The management reserves the right to evict, at our sole discretion and without refund, any person or persons who violate our camp rules. 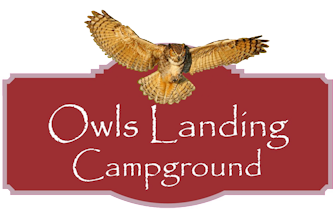 Anyone using these facilities must do so with the understanding that the campground is provided as a recreational facility only, and it may not be used as a primary residence. If you are asked to leave for any reason by the management of the campground, you must do so immediately or you accept that you will be treated as a trespasser by the appropriate local authorities. Camping has inherent risks associated with outside activities. We are not responsible for injuries or damages occurring as part of the inherent risks of any camping environment. All campers must maintain insurance; your units are not covered by the campgrounds insurance.